You are a Dancing Universe becoming aware of herself/himself. Yes, you are a Quantum Dream... shape shifting into New Realities. ​Cezarina embodies love, passion, authenticity, and child like wonder. She has opened my eyes to my potential and my true nature. She doesn’t force you to see the world the same way she does. She subtly and gently empowers you to lift the veil of unhealthy patterns of thought/action. This allows you to see life as it truly is. Due to my time working with Cezarina, I now know that I am worthy and capable of impacting the world in a positive way. I see the magic in every moment. She shares practical and heart centered tools from her extensive life experience, obtained knowledge and intuition. Cezarina also coached me through the loss of a loved one. After speaking with Cezarina, my heart felt lighter and I felt at peace. That’s what she does, she brings light to the dark places. If you are looking to live a heart centered life, look at your circumstances with child like wonder/awe, and know that you are light and love... I highly recommend you work with Cezarina. You will come out shining brighter than you ever thought possible. 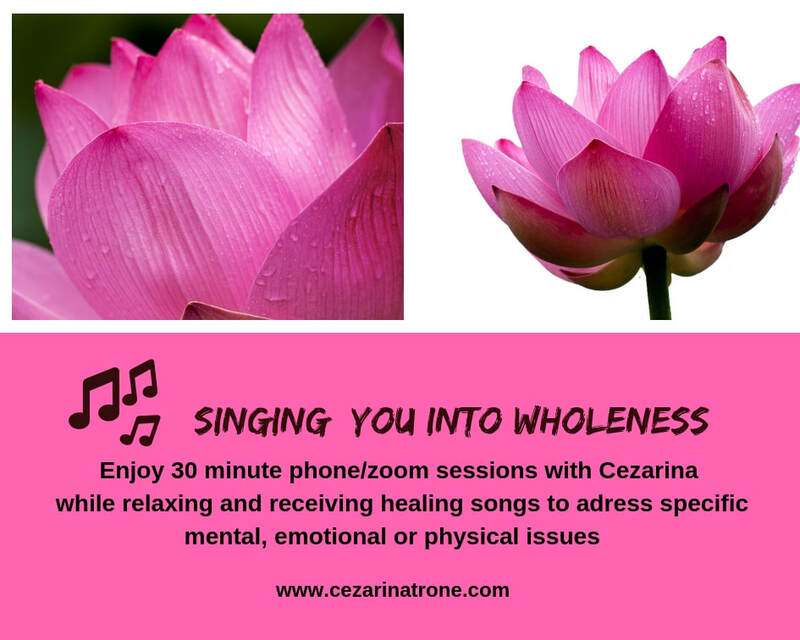 This is a special discount for a 30 minute coaching & healing session with Cezarina facilitated LIVE over the phone or on zoom video. We identify a need/problem/core issue and allow the New Energy of a Soul Song (Elohim song) to emerge in the moment (please note that each song is an unique remedy for what is needed in that moment). "WHAT Joyous, Magical Creations you bring int the world, Cezarina!